Some 40 percent of sales by Pickles Auctions is from fleets which gives the company a huge insight into what’s popular and what’s not and what’s the best method for remarketing used vehicles and equipment. 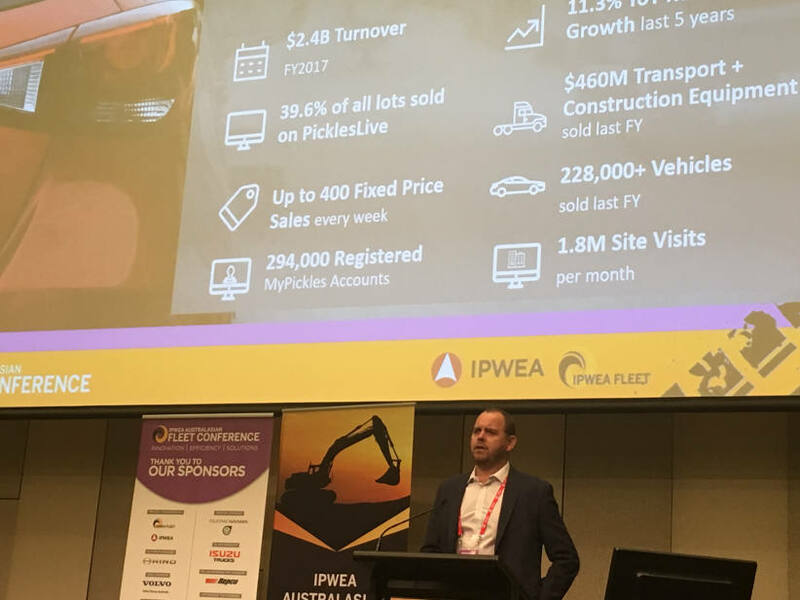 “Our data shows local council assets are among the most popular, reflecting good, and in-house maintenance,” said Brendon Green, General Manager of Motor Vehicles at Pickles Group, speaking at the IPWEA fleet management conference on the Gold Coast in March. Tracking resale values also shows that local and state government fleet vehicles also fetch better resale prices when sold at a fixed priced versus at auction, he said. Green identified three key areas for fleet managers to optimise resale values on assets: minimising unfair wear and tear by taking periodic (say every six months) reviews, including roadworthy certificates and attending to any minor rectification such as fixing scratches. As remarketing is a key focus for fleet managers it’s good to know what’s hot and what’s not and Green put up a chart showing just that at the Institute of Public Works Engineers Australia Fleet Conference. In the light car segment, the Mazda 2, the Hyundai i20 and the Toyota Yaris are hot. The Ford Fiesta isn’t. In the small cars, the Mazda 3, the Toyota Corolla, the Hyundai i30, Volkswagen Golf and Renault Megane are hot; the Holden Cruze, the Ford Mondeo, Ford Focus and Nissan Pulsar are more of a challenge. In the medium/large sedans, what’s hot are the Subaru Liberty, the Hyundai i45, the Mazda 6, the Toyota Camry and the Holden Commodore (SS and SSV). In the people mover category, what’s hot are the Toyota Tarago, the Honda Odyssey, the Hyundai iMax and the Kia Carnival. In the SUV range, there is a vast array including the Mazda CX range, Subaru Forester / XV, Toyota Prado, Kluger and Rav4 to name a few. Among commercial vehicles, the hottest include the Toyota Hilux/Hiace, the Ford Ranger, the Volkswagon Amarok/Caddy, the Mitsubishi Triton, the Hyundai iLoad, the Renault Trafic/Master/Kangoo and the Holden Colorado. The Great Wall V240 isn’t. All vehicles listed for sale with Pickles Live auctions are also listed online and Green said about 80 percent of assets listed attract online bids. The privately-held Australian owned company sold $2.5 billion in assets in 2017, including more than 228,000 motor vehicles. Pickles has warehousing equal in size to more than 60 soccer fields, is in 23 locations around Australia and has more than 900 staff. It holds something like 150 auctions and some 50 tenders every month. Its auction website attracts as many as 1.8 million visits a month. Its major clients include governments, carmakers, fleet organisations, banks and insurance groups. Green said engaging with Pickles early can help them help fleet managers to prepare the best plan for remarketing their used vehicles and equipment. As an example of how Pickles will do what it can to improve resale values for sellers, they’ve redistributed an influx of Holden Cruze that became available in South Australia to other states. “We worked with the client to increase resale values and seek out stronger markets,” Green said.